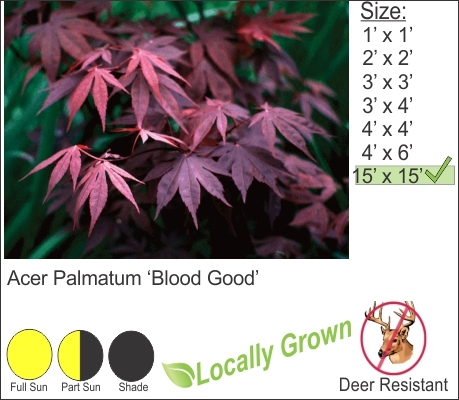 Bloodgood Japanese Maple is an excellent choice for a small growing specimen tree in your landscape. Burgundy foliage emerges in spring and provide but color throughout the season. In Autumn the leaves change to blazing reds and oranges. Bloodgood is also a good selection for one of the best deer resistant trees in the Hudson Valley. This tree works well with evergreen shrubs like Japanese Garden Juniper, Boxwood, and dwarf Spruce.